The TED conferences taking place this week in California are famous for their brainy presentations (held by futurists, technologists, the odd “paper-cutter artist”) and a rapt audience (a Comic-Con of early adopters and outliers), where a biomedical engineer might cede the stage to an artist who “reshapes urban airspace” while Bill Gates takes notes. Soon, TED could be known for its coffee, too. 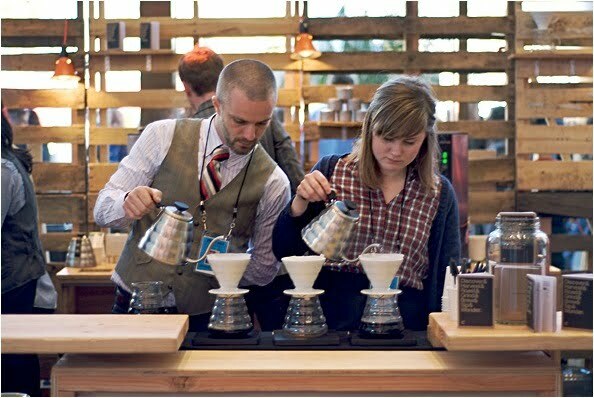 This year the TED conferences are outfitted with seven coffee bars staffed by a roster of international all-star baristas, more than 40 in all, that include World Barista Champions and baristas with cult followings in their hometowns of Oslo and Sydney, Guatemala City and Montreal. 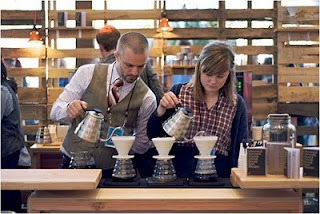 They should be professional rivals – the baristas work for different coffee shops and roasters – but they’re at TED under the auspices of Coffee Common, a newly-minted organization with the unapologetically idealistic purpose to create “a community with shared values.” Counter Culture Coffee, Intelligentsia Coffee and Tea, and Stumptown Coffee Roasters might duke it out for wholesale accounts in New York City, but at TED they’re all on the same side. 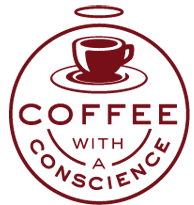 So you have Counter Culture’s Peter Giulliano praising MadCap Coffee Company, an upstart roaster from Grand Rapids, Mich., that was founded in 2008. (He writes in a Tumblr post that MadCap is “young and fearless.”) Or Stephen Morrissey of Intelligentsia, a former World Barista Champion, preparing Terroir Select Coffee’s Mamuto (from Kenya) in the morning and Ritual Coffee Roaster’s La Orquidea (from Colombia) in the afternoon. Citizen Bean is about coffee, from seed to cup. Of special interest is the new generation of small, expert roasters. This blog is dedicated to bringing a better understanding and appreciation of organics, fair trade and sustainability throughout the community.